Goodwill Industries of San Diego County has more than 50 locations throughout San Diego County, employing more than 1300 residents. While their mission is to enhance the dignity and quality of life by helping people reach their full potential through education, skills training and the power of work, their organization also firmly believes in providing their employees with access to healthy options while at work. 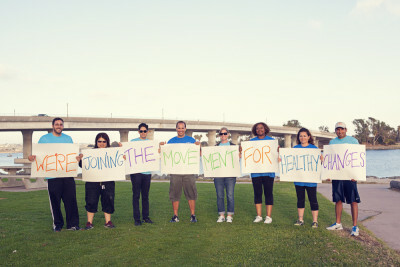 With the support from Live Well @ Work – UC San Diego Center for Community Health, a project funded by CDPH though the County of San Diego Health and Human Services Agency, Goodwill Industries established an employee wellness program, Good Willpower, in 2013. 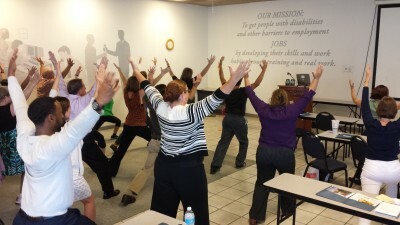 This thriving program also created a wellness committee to support various employee-driven initiatives. With the support from Live Well @ Work, Goodwill’s wellness committee assessed their lack of current healthy snack and beverage vending options, which ranged from only 5 percent to 10 percent. Collectively, the committee decided to pursue an upgrade to their vending contracts to provide employees with a minimum of 40 percent healthy snack and beverage options. Vending machines are located at eight sites in a variety of locations, including retail and donation centers, employment centers, destruction sites, and corporate offices. In partnership with their current vending company, Canteen Vendors, one of the nation’s largest and longest running vending companies, Goodwill was able to offer healthy vending alternatives that taste great and supports a healthful lifestyle. Canteen Vendors offers a healthy vending program, “Choice Plus,” to improve the well-being of employees with options that enhance the existing Good Willpower Wellness Program. Canteen’s Choice Plus Better-for-you Options were designed by a team of registered dietitians and culinary experts. The options include granola, fruit bars, dried fruit mixes, trail mixes, low-fat and/or baked chips and crackers, and more. Beverage options include unsweetened flavored and unflavored waters, tea, coffee, low-fat dairy milk, among others. Choice Plus items’ nutritional criteria reflect the latest research, legislation, and client standards around healthy snack and beverage options. These healthy vending alternatives provide a balanced approach to vending by linking wellness, sustainability, and humanity to encourage healthier lifestyle choices. Goodwill Industries employed a comprehensive approach to their Choice Plus vending program. First, the wellness committee designated one committee member to champion this program. Next, key stakeholders were engaged in the process, including administrators, fiscal leads, upper management, and current vending companies. Simultaneously, Canteen Vendors conducted an evaluation of their current vending sale trends to identify how Canteen’s addition of healthy options can fit with Goodwill’s wellness goals and initiatives. Onsite managers, employees, human resource staff, and wellness committee members provided input and feedback on these proposed changes in order to design a program to fit the needs of their employees. Additionally, prior to the launch of the Choice Plus vending program, Live Well @ Work developed a communication and marketing plan to market these changes. Employees were informed of the Choice Plus nutritional criteria and snack options through the use of social marketing strategies, including e-blasts, vending machine posters, employee newsletter articles, wellness board postings, employee website features, and supervisor announcements to promote healthy behavior change. 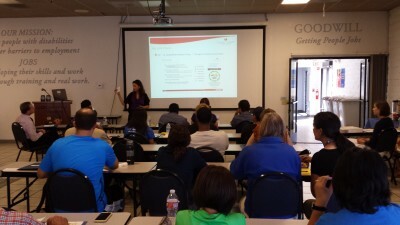 Live Well @ Work offered complementary nutrition education sessions to employees, including lessons on nutrition fact label reading, healthy snack and beverage choices, and MyPlate basics, to facilitate employees making informed choices. In order to promote the Choice Plus options, these products are clearly labeled within the vending machine and their nutritional breakdown is outlined. 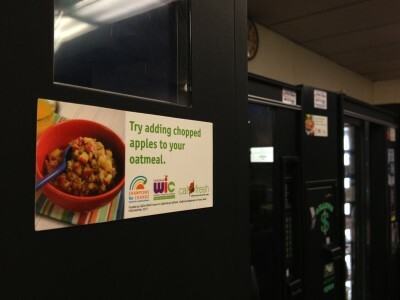 Also, to support the purchasing of healthier choices, product placement strategies were utilized by putting healthier snack and beverage options at eye level and putting less healthy options near the bottom of the vending machine. In order to sustain these environmental changes, Live Well @ Work supported the development of a Healthy Vending Policy with the Goodwill wellness committee to be included in their Policies and Procedures Handbook. This written policy clearly defines “healthy” beverage and food standards, and facilitates consistent communication of organizational goals to vendors and enables effective monitoring and evaluation. The contractual change between Canteen Vendors continues to be maintained and evaluated by Goodwill. Evaluation measures developed by Live Well @ Work continue to be collected to assess employee receptivity and inform changes to allow for improvements. The success of this effort has been demonstrated through tracking quarterly sales data, employee surveys, and wellness committee feedback. Future direction includes the expansion of the healthy vending program to additional Goodwill locations throughout San Diego County in order to increase access to healthy food and beverage options for their employees. Previous Article: New report released on the inclusion of breastfeeding measures in electronic health records.